A few thoughts on the Arsenal 6-1 Southampton league match | "It's all about the Arsenal"
Dropped off at Harlow Town by her indoors, stood on the platform waiting for train with all the other Gooners and they say this is a Spunts Town. The last 20 years has changed that, as new generations of people have grown up supporting the Arsenal. 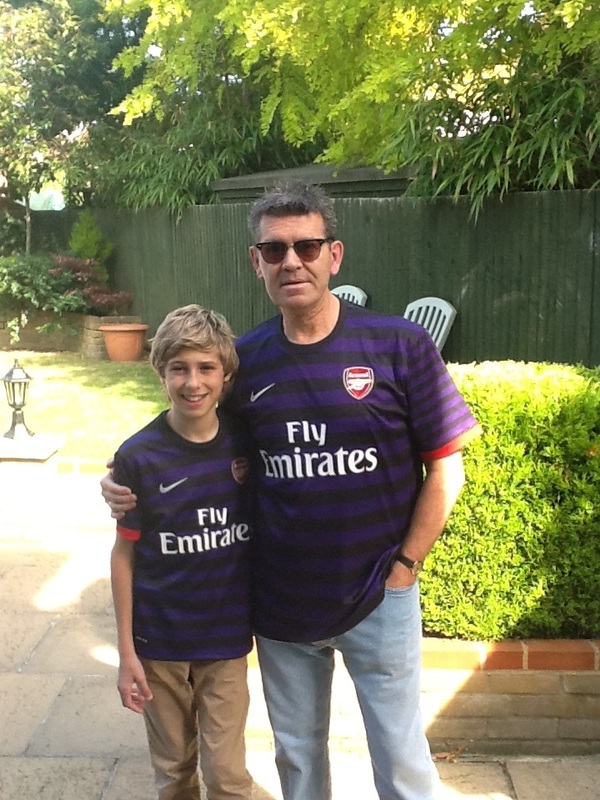 Also huge new housing estates (Church Langley and Newhall) have brought many Gooners to the town. Arrived at Emirates about 2.15 and took our seats which today were situated Upper Tier, East Stand, with a great sideways view of the goal at the Clock End. Watching Santos warm up and boy does he have some tekkers… 2.30 the team is announced on the big screen by Mr. Wenger after being asked some stock questions about the Liverpool victory a few weeks back. Szczesny, Jenkinson, Mertesacker, Vermaelen, Gibbs, Coquelin, Arteta, Oxlade-Chamberlain, Cazorla, Podolski, Gervinho. Subs Walcott, Giroud, Ramsey, Mannone, Koscielny, Andre Santos, Arshavin. Szczesny back in-goal in place of Mannone, Coquelin to start in place of Diaby which is a bit of a surprise, but maybe the two games Ramsey played for Wales made Arsene’s decision for him. Giroud starting on the bench, however he said himself he was thinking he would start on bench after transfer. Gervinho to play down the middle… Wenger said “we turn our wingers into forwards and our forwards into wingers” How many clubs can put out that sort of subs bench and that not including Wilshere, Sagna, Diaby, Djourou, Rosicky. The ground is slowly filling up, very slowly that around 2.55pm, I reckon there was about 30k on the terraces. That last five mins is when the terraces fill. Which is a pain as some late comers start arriving around 3.05 and you’re up and down like and tarts knickers. It’s said that you can only beat what is put in front of you and today it was the new boys to the prem Southampton. Their fans below “you only have one song” Oh w…h…e…n t…h…e.. S…a…i…n…t…s… g…o… m…a…r…c..h………………… you get the picture, gets a bit boring…. Goooooooooooooal!!!! Cazorla in the centre lays the ball to Podolski who has two players with him, he first loses the ball but sheer strength from him wins it back, strides forwards and lays a good ball in-between two Southampton players to Gibbs who shoots and the ball goes in off Hooiveld for an OG… 1-0 to the Arsenal! Cazorla-Gibbs-Gervinho-Podolski-Cazorla-Gibbs-Gerviho-Podolski-Gervinho and just as forehead is about to finish of a silky smooth passing move, the Southampton defender puts it our for a corner. Cazorla takes and floats the ball in, Davies flaps and the ball falls to Coquelin on the edge of the area, he looks like he is going to shoot but chips up a cross and there is the BFG who heads at goal and Davies makes a simple save. 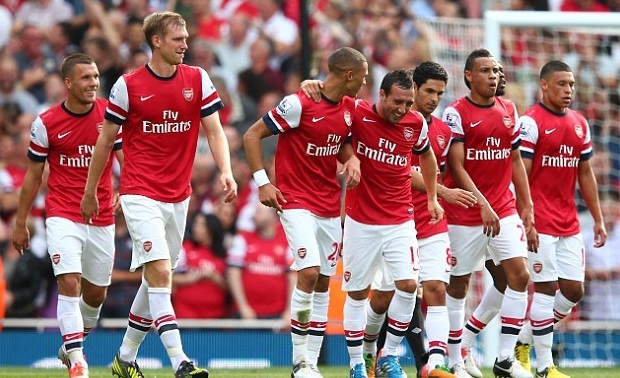 Arsenal comfortable, playing some superb passing football with Cazorla, Arteta and Podolski at the heart of it. Goooooooooooooal!!!! Arteta-Cazorla who crosses and the ball is headed out to Coquelin who take it out the air nicely and is hacked down by Davis for a free kick. Cazorla and Podolski line up to take it. From where I am sitting Podolski side on looks a cert to take it. 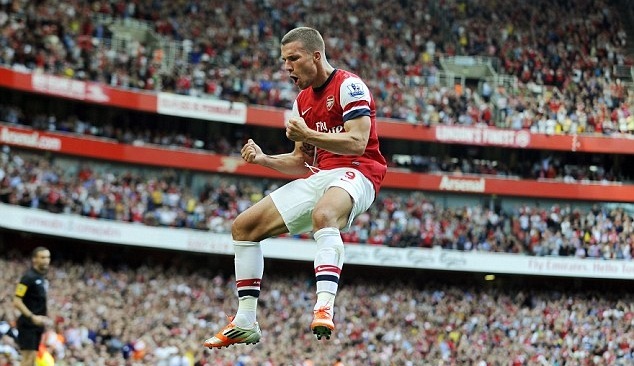 Podolski steps up, little back lift and plants a worldy of a shot past Davies into the net… What a goal. Watch Arteta on the reply mouthing WOW!!! as the players celebrate. 2-0 to the Arsenal! Goooooooooooooal!!!! Own goals R us!!! Gervinho-Podolski-Arteta-Cazorla-Podolski-Cazorla-Gervinho skips a challenge and lays the ball off wide to Gibbs who crosses and the ball flies in off the right foot of Clyne for an OG to make it 4-0 to the Arsenal! Sunny day, Arsenal 4-0 up and the smiles around me make Emirates a great place to be. There goes the clean sheet start to the season. Arsenal can’t get the ball way, a shot from Prowse is blocked by the Verminator and it falls to Puncheon who crosses high to the back post and what should be a simple catch for Szczesny is spilt by him and the ball falls nicely for Fox to slam the ball left footed into the roof of the net 4-1. Szczesny had only just punched one away and he should have caught that cross easy, he could have just punched it clear if needed. Poor goal keeping. HT 4-1… Down onto the concourse to get the boy a foot long hotdog and coke. Arsenal have started the second half – half asleep. Maybe being 4-1 up they took their foot of the gas and started to let Southampton play. None of the chasing down that was evident in the first half. Ramirez tries a long-range shot that is scuffed and yet goes right across the area and falls nicely for Lambert who recently scored against both City and United should have scored against Arsenal, yet somehow puts it wide of Szczesny and wide of the far post. Lucky escape there, should have been 4-2. Chamberlain (wide) Ramsey comes on for Coquelin. Goooooooooooooal!!!! 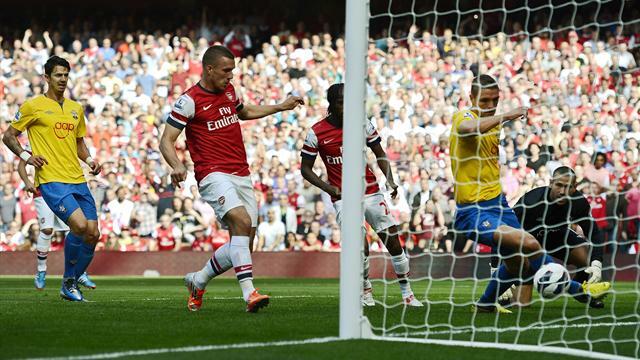 Podolski take the ball nicely out of the air and lays it to Cazorla who in turn passes to Ramsey. Ramsey controls it on his right, flicks it over Clyne and leaves him for dead, strides forward and flicks the ball with the outside of his right foot across the goal for 5-1, but NO! it hits the post, yet falls nicely for Gervinho who is sniffing to control the ball with his left and tap it in with his left for his second goal of the day. Normal service resumed 5-1 to the Arsenal! 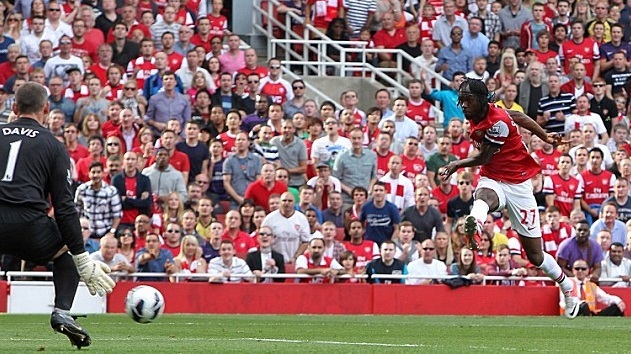 Gervinho goes off to a standing ovation from the crowd and replaced by Theo. Podolski also goes off to replaced by Giroud. Mertesacker-Ramsey-Cazorla-Gervinho-Arteta-Chamberlaim who hits a cracking shot that was going into the far top corner of the net and saved superbly by Davies in-goal for a corner. Goooooooooooooal!!!! Vermaelen-Ramsey-Cazorla-Vemaelen who shoot with his left, well saved by Davies but only parry the ball to Arteta who taps the ball to Theo who coolly left foots the ball into the left hand side of the goal for 6-1 to the Arsenal! Nice of Theo to not rub it in by going mad in celebration. Good to see Theo and Oxo go over and applaud the Southampton fans, showing a bit of class. That’s three games out of four with no bookings for Arsenal save the match at Liverpool with Webb in charge. thoroughly enjoyed the day. Team played well save a 25 min spell at the start of the second half. Well deserve win and good to see the lads going for as many goals as they could score and looking like they were enjoying the game as well. The team were playing with a flair about them, passing the ball around like Wenger teams of the past. It seems the bad eggs have gone and this new/old squad of players want to play, want to win both as individuals and a team. They battled for each other in the sun. Southampton are not the best by a long chalk, but Arsenal made them look poor by dominating the passing game. At times Southampton could not get near the ball as the speed of the one touch passing, well, passed them by. Two tough games now against city (away) and Chelsea (home) that should tell us where we really are this season on the improvement front and I for one cannot wait.